Wyvern is a cut above the average from the Science Fiction Channel offerings. The Wyvern is a mythical beast from the ancient Norse religion who was a complete killing and eating machine and when it bit Odin, Odin banished him to the frozen icecap. But as we know the icecap has been melting so the dragon creature is loose. As Sci-Fi Channel B-movies go, this is a good one. It is neatly paced and doesn't drag, and the characters, although clichéd, are well-played and likable. 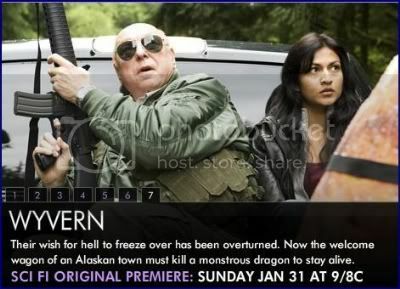 The basic premise is that a very small, remote town in Alaska is terrorized by the appearance of a wyvern (a non-fire-breathing dragon, for those who care). "Wyvern" also makes many sly references to the TV show "Northern Exposure." Casting Elaine Miles ("Marilyn Whirlwind" in Northern Exposure) in the role of a sheriff's deputy is a sure tip-off. Ms. Miles remains laconically funny as ever. The presence of the character of a doctor who is from out of town is another tip of the hat. This flick is a clear six (6) as a general rating, and a 10 as far as movies made for the Sci Fi Channel go. It has a substantive cast including: a recognizable good guy (Nick Chinlund who often plays a detective); two really good old guys (Barry Corbin is an ace and the late Don Davis is well known as the general from the Stargate series); and two attractive young women (both Canadian I believe) including the very pretty Tinsel Korey who seems to be Native American.Comment: A rating of 6 for movies in general but 10 for Sci-Fi Channel movies? In other words, Sci-Fi Channel movies are mediocre. The reviewers seem to agree that Wyvern deserves a mediocre rating. Yet they're a lot more enthusiastic than I've ever been about a movie I rated a 6. I wouldn't choose to watch a movie rated this low unless it had a Native aspect. I don't know if Wyvern has any Native aspects other than actors Elaine Miles and Tinsel Korey, but I may watch it if it comes out on DVD. Let's note that the Sci-Fi Channel has put out a fair number of movies and TV shows featuring Natives. The ones I've covered include Hybrid, Friday the 13th: The Shaman's Apprentice, Man-Thing, Aztec Rex, and Lost Colony. Give the Sci-Fi Channel points for including Natives, but take away points for putting them in stereotypical stories with shamans, magic, and monsters. The network could do a lot better, but it also could do a lot worse. "The basic premise is that a very small, remote town in Alaska is terrorized by the appearance of a wyvern (a non-fire-breathing dragon, for those who care)." Sounds like a biting allegory concerning "Sarahcuda", mayor of Wasilla.